Springtime is upon us! As we begin to get away from making hearty soups and heavy dishes, we turn to lighter, airier foods that are delicious and fun to make. 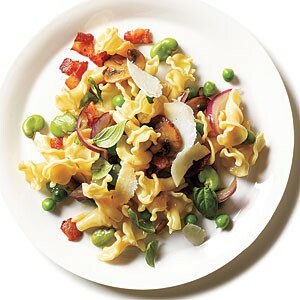 Today, we have an easy to make recipe for Springtime Pasta With Peas & Beans. 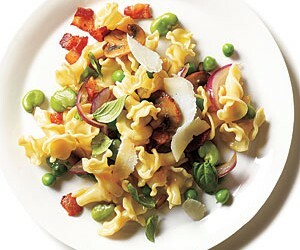 This is a perfect dish for a nice spring day. It doesn’t take a lot of effort, but it certainly will not disappoint. Give this recipe a try! Begin by cooking the fava begins in a large pot of boiling water. The beans should cook for approximately 1 minute. After a minute, drain the beans and rinse them off with cool water. Be sure to drain them well so that all the excess water is removed. Remove the outer skin from the beans. Next, cook your pasta according to the directions on the package. Do not add any salt to your pasta at this time. Turn your stove on to medium-high heat and 1 tablespoon of extra-virgin olive oil to a medium sized skillet. Add your bacon and cook until it begins to turn brown. Add the garlic and the onion, and saute until the veggies become tender. Add the sliced mushrooms and cook for approximately 3 minutes or until they begin to turn brown. Next, add the peas and the fava beans. Cook them for approximately 2 minutes. Add the remaining tablespoon of olive oil as well as the cooked pasta, lemon juice, and salt. Cook until everything has warmed up. Mix in 3 tablespoons of cheese. Serve your pasta and top it with the remaining cheese and the torn basil. Enjoy!